There are so many times when I’m writing a post and I get really excited about what I’m sharing with you. I always think to myself “Man, I hope they all like this as much as I do!”. So when I look back at the top posts from the previous year and I see some of my own favorites, it makes me very happy. This sporting goods gift ideas post is part of a Fashionista Event and a promotional item was provided to me. Hosts for this event are Still Blonde after all these Years and ModlyChic. Father’s Day is coming up and this year I have my eye on sporting goods for hubs. He loves to fish and camp and just be outside in general, and Bubbles has become increasingly interested in those things, too. I thought it would be appropriate for her gifts for Daddy to be things they can do together. If sporting goods are on your list, too, Cabela’s has lots of great options. They’ve even put together a “Tents & Tackles” gift guide for you to make it extra-easy. Growing up in Maine, there were always plenty of adventurous winter activities in which to participate. 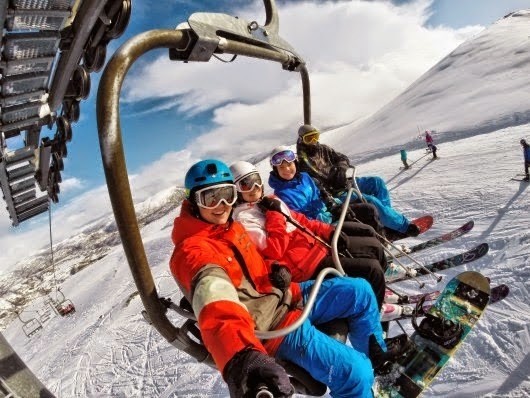 Skiing and snowboarding, cross country skiing, snowmobiling, ice skating parties, ice fishing. You name it, we were outside doing it.